26-Jul-2018 -- Driving southwestward along an autoroute towards my evening destination of Biarritz, I made a short detour to visit this fairly easy Degree Confluence Point, which lies on the edge of one of the many tracts of pine forest in this region of France. A narrow gravel road passes just 100 m west of the point. Deep ditches (filled with water) line the banks of this road, so it was a bit tricky to find a good place to park, and a good place to hike across the ditch to get to the point. 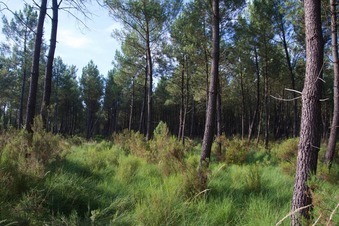 The point lies within long grass, just within the edge of a pine forest. As I approached the point, I could see that much of the grass had been tamped down - telling me that other people had visited here recently. I was also interested to see gorse growing here. Gorse - introduced from its native Europe - has become a major problem in my home country of New Zealand; it was interesting to finally see some growing where it actually belongs.